Govt doesn't buy restaurants' input tax excuse and has swing into action and looking into profiteering complaints on social media against prominent restaurant and franchise chains. With most restaurants increasing prices despite a cut in Goods and Services Tax (GST), the government’s calculation reveals that prices would come down despite discontinuation of input tax credit benefit. Quashing the argument of restaurants in favour of a price hike, calculation by the government shows the impact of input tax credit would not be more than 6 per cent of the base price for large eateries which have franchises, and much lower at 2 per cent for smaller ones. “It is learnt that a lot of franchise chains have not lowered the price, our calculations show the impact of unavailability of input tax credit should be no more than 5-6 per cent. So they should pass on the rest at least,” said a government official. For example, on a base price of Rs 100, an 18 per cent tax earlier meant Rs 118 as the final payable price. With an estimated 6 per cent input tax credit, the base price could go up to Rs 106 and a 5 per cent GST on it will take the final price to Rs 111.3. This means that consumers would still get the benefit of Rs 6.70. “Large franchise outlets like McDonald’s and pizza chains may have a higher input tax credit on account of franchise fee and rentals on which the GST is charged, but even that should not be more than 6 per cent. For smaller restaurants it should not be more than 2-3 per cent,” the official said. The government is now waiting for the restaurants to respond. In the previous GST Council meeting in Guwahati on November 10, restaurants saw the steepest reduction in rates to 5 per cent from 18 per cent but without input tax credit. With the tax reduction coming into effect from November 15, most restaurants were seen increasing the base price and not passing on the benefit to consumers. This prompted the government to swing into action and look into profiteering complaints on social media against prominent restaurant and franchise chains. Central Board of Excise and Customs Chairman Vanaja Sarna recently wrote a letter to restaurants and fast-moving consumer goods companies to pass on the rate reduction benefit to customers. “I appeal to you to join hands with the government in benefitting the common man by passing on the benefit of the reduced GST rates through commensurate reduction in the process of your products,” Sarna said in the letter. While many FMCG players, including Dabur, ITC, HUL and Marico, have reduced the maximum retail price charged, restaurants are yet to pass on the benefit. “We have asked restaurants about the input tax credit they would avail. We are waiting for them to respond. According to our assessment, there is a case of profiteering,” said another government official. “Whatever yardstick you apply, prices should come down at restaurants. It should be even more for smaller players as they do not have rentals or franchises fee on which the GST is charged. 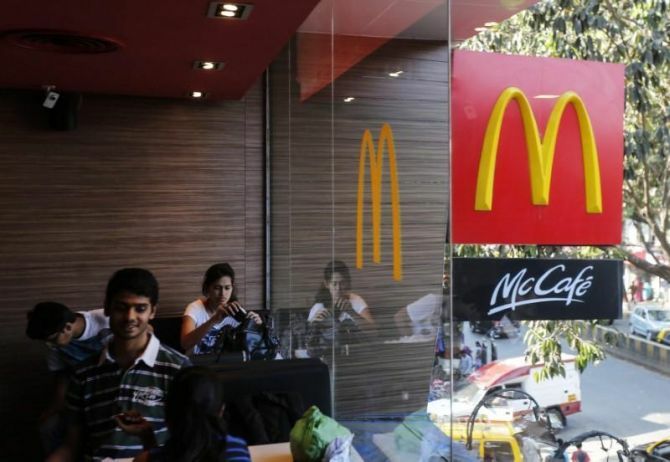 But the level of input tax credit would vary among foodchains,” said Pratik Jain of PwC India. Restaurants have mainly made two arguments over raising the base price. One, they are free to hike prices, and have done that in the past taking into account inflation on inputs. Second, that they will no longer get the input tax credit. Government officials said that while it is well within the rights of a restaurant to hike prices, doing that on the midnight of the reduction in the GST indicates profiteering intentions. Only restaurants in five-star hotels with tariffs of over Rs 7,500 a night will attract 18 per cent tax.